I made another Cable Hat. I'm calling this one the 3AM Cable Hat because I was nursing my baby girl at 3AM ... and I was thinking about how to tweak the Pink Cable Hat while walking her around to get her back to sleep (it's amazing how active my mind is while walking baby back to sleep in a dark room). I wanted to make it slightly shorter, with shorter K2P2 ribbing and CF6 every 8th row. So after I got baby to sleep, I went to scribble down my notes. This is what I came up with. It's a lovely hat and a great tute, but I've got one question. Is this worked on straight needles, DPN's or circular needles. 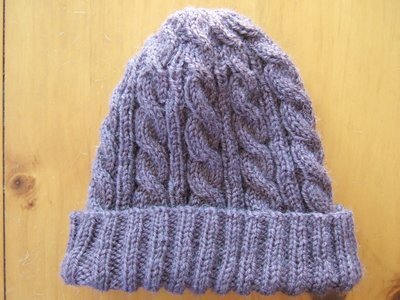 If it is on straight needles, how do you make it from a *flat* piece into a hat? I seem to be having trouble getting the ribbing and the cables matching, what am I doing wrong? I LOVE this hat! I am currently working on my fourth one. I just wanted to let you know how much I love this pattern! I have made SIX of these hats, and I just can't get enough. You've written a beautiful, well-thought out and easy to follow pattern. Thank you! Kently: What you would do is P1. Then you repeat * CF4, P2 * across the round until you have 5 stitches left on your left-hand needle. Then you do CF4, P1 on those last 5 stitches. Hope this helps. Lovely hat! I don't see mention anywhere of approx how many yards it takes for the hat in worsted or DK weight. Would you mind giving an estimation of how many yards are needed for each weight hat? Oh if you dont' know yardage would you mind giving # of oz. thank you. Depending on how large you make your hat and/or how much ribbing you want, you should be able to knit this hat with less than 100 gm of yarn (or less than 200 yds). You will find lots of great knitting instructions at http://knittinghelp.com , they have videos to show you how to do it. Oh wait! Can I have your permission to make some of these and donate them to needy children in the area? Yes, you may knit these hats to donate or sell. Thank you for offering so many nice free patterns. 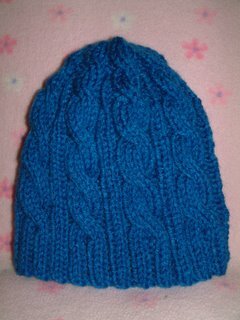 I love the 3am cable hat...it's going to be a regular pattern for my stashbusting, both DK and WW yarn! This pattern is LOVELY!! I am going to try to make it to send to a cadet who helped my troop at West Point this past weekend. Thanks for making your patterns available! I just made a tweaked version of this hat for my sister. It's beautiful! I love it (I almost took it away from her)! I reeeeaaaaallly want to thank you for sharing this pattern. The instructions are so simple ANYONE can make it! (I, as a 7th grader, can testify to that.) Thank you! I'd love to knit this hat, can you knit it on straight needles or does it have to be circular needles? Thanks so much for this pattern--I did one very similiar for my daughter 2 years ago, and could not find the pattern again...because it is knitted in the round with worsted weight yarn, it knits up in a night or two, and once you get into the grove of the pattern, it is almost "mindless" and is easy to adjust the size if you need it bigger or smaller, and can be made in several variations if you don't do the decrease rows, knit in pattern for the number of decrease rows, bind off, divide into forths, stitch up, and do Pom poms at the four corners...or for that matter, I cord and tassels...the possibilities are endless! Cascade 220 and Plymouth Gallway all work well...thanks for a pattern that is stylish and a cinch to do!!! Just wonderful! In response to Jenny D, yes you could knit this on straight needles...but remember on circs you are knitting the front always, so you will have to change every other row to be knit from the wrong side accordingly...if you have not knit in the round before, I would suggest this pattern as a place to start....get yourself a pair of circular needles, and just try it...I started knitting on circs early on, and I now use them for EVERYTHING !!! I knit afghans, lace, sweaters, socks, scarves, hats, mittens, everything on circular needles--even when the directions call for DPNs... Once you catch on you will wonder why they even sell straight needles--best of luck to you! If you need help, go to your LYS...most ate happy to assist! thanks for this pattern! I just completed my hat. I made it with casting on 120 stitches, 10mm knitting needles and used Lion Brand yarn (super bulky). incredibly warm hat!